And they’ve been weathering since two hundred years B.C. these steps are Roman, and to be found in Fiesole near Florence, Italy. They’re my entry for this weeks photo challenge at the daily post. Happy Thursday all! That I can’t choose between. I get a bit snap happy when I’m in a new, exciting place, and I must say that since I’ve been taking photos, I notice the world around me so much more. I do get fed up with carrying things though, so some days if a camera feels too heavy or it won’t go in my bag of the day, I’ll move down to a smaller one. Of course the phone is the easiest option, but limited in its capabilities. I rarely take my dslr out these days, so these three images were all captured with my biggest active camera. They’re the ones I like best from a week in Florence, with a day out in Tuscany. Do you have lazy camera days or are you okay with carrying heavy things? Perhaps it’s a girl thing, after all we do need ALL the contents of our handbags, an umbrella if it rains and a warm layer if it gets too cool! Enough waffle, these are the three photos. Like or dislike any of them? On our second full day in Florence we decided to do part of a walk in a guide book. We weren’t following it exactly because it didn’t make sense. Okay I’ll confess, the first part was too close to our hotel, so we skipped it. In doing so, we emerged on the river bank further east than the walk, so took a slight diversion. Where’s the fun in exploring a new city without going up some back alleys? We emerged on Piazza Santa Maria Del Carmine, where the church of the same name had a rather dull exterior, and had a peep inside. 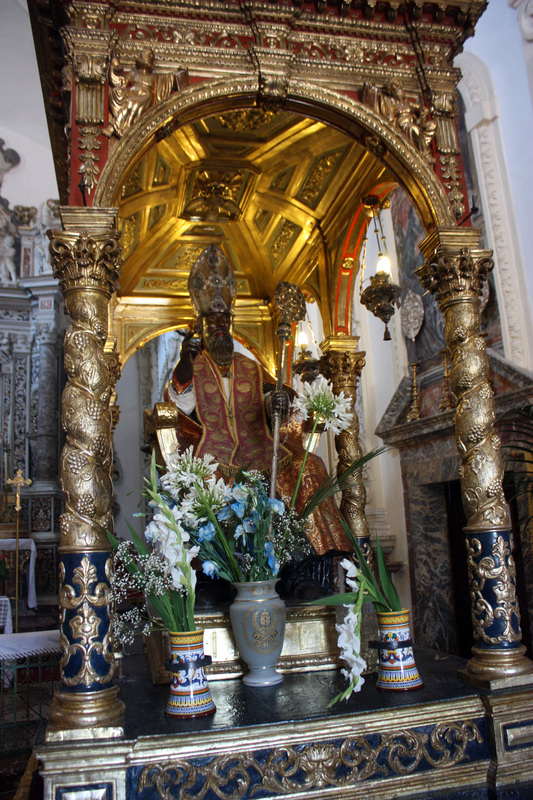 This church of the Carmelite order was built in 1268, but was damaged by fire in 1771 and the interior rebuilt in the Rococo style 11 years later. It was nicer inside than out. We got our bearings back and headed for the Via Santo Spirito, occasionally getting distracted, wondering what was up there or around that corner. One of the things we did find from the walk description, was this pretty stone tabernacle from the 14th century. The fresco of the Madonna with Child and the Saints Paolo and Gerolamo) is reputed to be the work of Bicci di Lorenzo. The little figure between the saints is the person who the commissioned the fresco. A sharp shower sent us rushing for an espresso and a bit of a sit down. Towards Santa Spirito, the heart of this creative, bohemian area. Oltrarno is the home of many artisan workshops, including the fabulous shop I showed you last week. Surprises and smiles are around every corner. Close to a nursery school, we came across this moving sculpture, in honour of the Armenian genocide. Back to the streets and we were drifting south to what we thought was a secondary entrance to Boboli gardens. So we turned tail towards the direction of the river, passing elegant gates leading to secluded mansions. We didn’t fetch up where we expected even then. Instead we found the Pitti Palace and lunch in a cafe opposite. I made a mistake in that cafe, ordering something with meat. I was quite upset that I’d mixed a word up, but they kindly changed it for what I’d intended to order. That’ll teach me not to think I’m too clever! and of course I loved this sculpture. We ended this walk, which I’m sharing with Jo, who knows it well, at Ponte Vecchio. I wonder where she’s walking this week. Santa Maria Novella . . .
railway station in Florence gets its name from the church just around the corner from it, and it’s where I arrived for a week in that lovely city. I took this early evening photo from my room on the fourth floor of the Rosso 23, looking at the Piazza Santa Maria Novella. I’ll post more in the next few weeks when I’ve caught up a bit! I said that the five day challenge would take me longer to complete and sure enough here I am with day three, several days later. Issy at http://isadoraartandphotography.com/2015/02/15/5-day-bw-challenge-day-2/ picked me and I’m going to choose Rommel today (only if you want to Rommel!) http://thesophomoreslump2.com/ My photo shows the Citta Alta in Bergamo, northern Italy, from my hotel room. 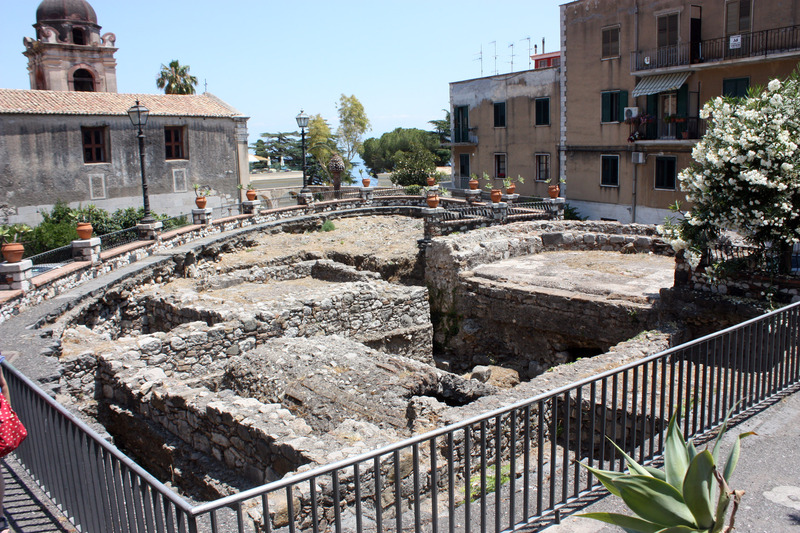 The Upper City is surrounded by Venetian walls built in the 16th century. It has several piazzas, palazzos, including one built in the 12th century, and numerous churches. 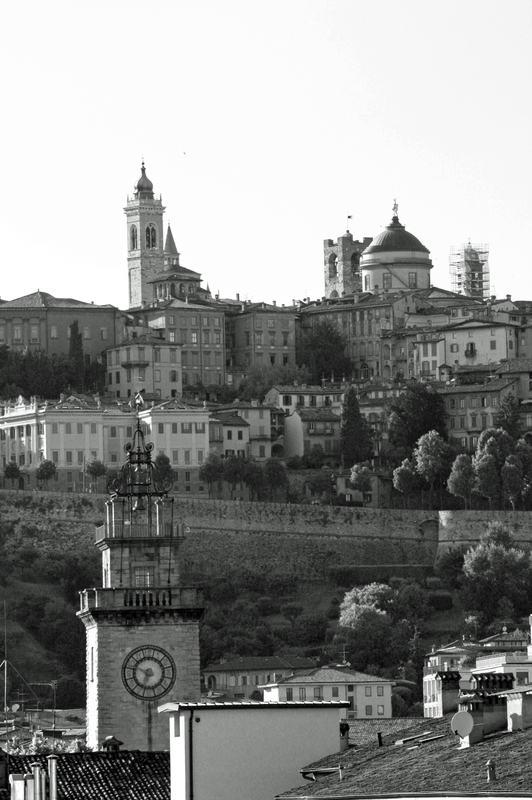 Bergamo is an elegant city, 25 miles from Milan and well worth a visit – the budget airlines fly there from the UK! I think this must be taken on the streets for festivals because it had long handles. It was inside St Pancras , a chiesa built on the ruins of a Greek temple of Jupiter. Just up the hill are the ruins of a small Roman Odeon. 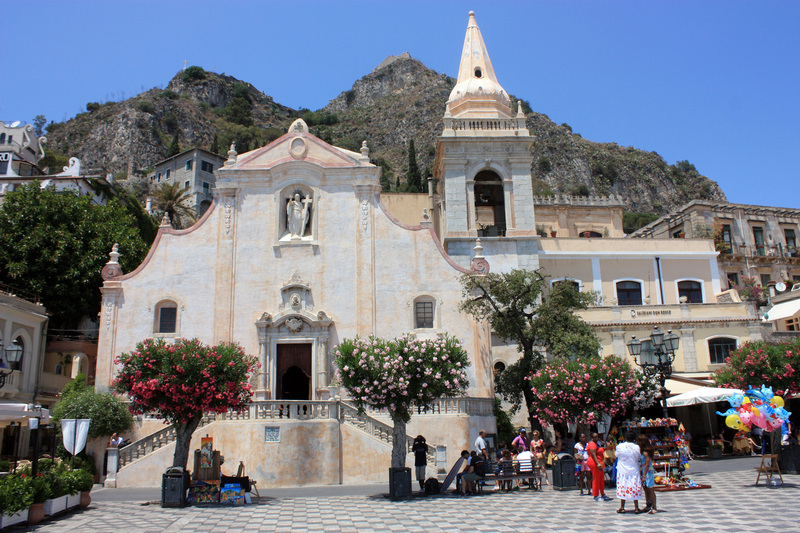 I wasn’t very interested in going to Taormina because it’s such a tourist trap, but of course there’s a reason for that – it’s stunning! I’ll be back in a few days to share some more photos. Have you ever visited a place and felt that you nust have missed it? After an early Sunday morning start and jeep tour of Etna (I know, I’m getting to it!) travelling friend and I had a couple of hours to pass before dinner, and amazingly since we had hiked up five thousand feet, still some energy left. On the way we went through Giarre and Davide explained the hideous traffic as all the locals heading for their nearest beach at Riposto. We thought we would check it out. 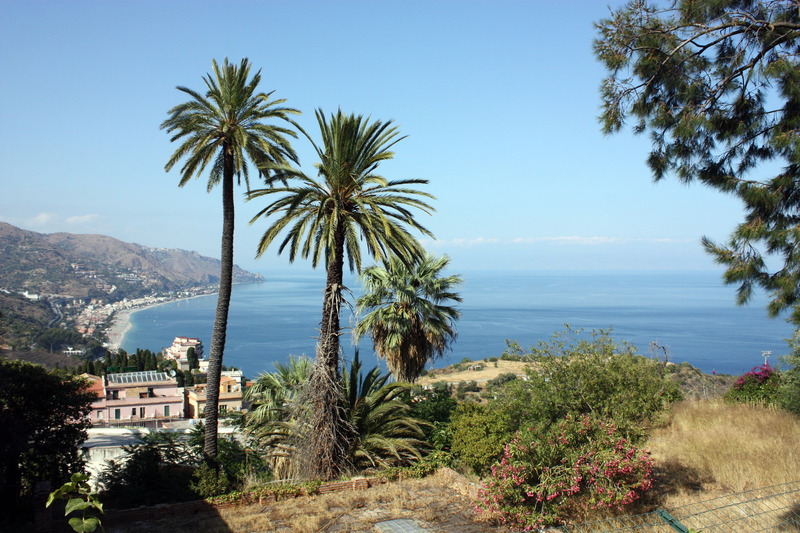 Compared to the country roads, it was still busy at five thirty and Giarre was only place in Sicily where we experienced the wrath of a Sicilian driver thoroughtly irritated because we tried to take a wrong turning. He even did fist waving. Maybe one day he will find out what its like driving on the wrong side of the road, in chaotic traffic with a distinct lack of direction signs! After going in circles for twenty minutes looking for the Old Town of Giarre because the guide book said it was nice, we found ourselves at Riposto, with a quiet road to park on and a nose for the direction of the coast. The only shops we saw were selling clothes, for skiny women to wear clubbing and gelatto shops. I’ve since learnt that Riposto has a reputation for the best gelatto anywhere, but we were stuffed from cheese and honeytasting at our late lunch and looking forward to antipasti and fish for dinner. We could smell the sea and were anticipating a paddle and stroll along a nice beach, it must be good to account for the morning’s traffic and crossed onto the prom heading south. There was no beach, just a few metres of rocks with quite a bit of rubbish. Oh well, the fresh air and gentle stroll was nice as were the views of the mountains so we pootled for an hour befre giving it up as a bad job. We chose to drive the coast road in the hope that there would be somewhere pretty to stop again but instead got in a traffic queue. It seems that the place for a market in Riposto is the road beside the sea, we we were going slow enough to have reached out the windows and bought from the stalls each side. Now, I’m a real fan of a good market, especially in foreign countries, but I’m not a fan of cheap imports and I can’t imagine who would buy such junk and there was masses of it. Sad to see when there is so much creativity and wonderful local produce, such as the cheese we had tasted earlier. There was nowhere obvious to stop and see if the beach got any better, Riposto just trickled on until we reached Fiumefreddo. The beach there is still shingle but very clean. I’m sorry Riposto that I can’t write that I found your beauty and that it was a pleasure to visit. If I’ve missed something wonderful perhaps you’ll invite me back and show me around, I promise to tell everyone they must go if you do! Meanwhile you get a four out of ten I’m afraid. Marianne has bright colourful door furniture to show you, whereas mine are a bit brown! She can be found at http://eastofmalaga.net/2013/05/01/cbbh-photo-challenge-knobs-and-knockers/ and you can also join the challenge there. Add some photos, introduce two blogs you like and you’re done! The first blog I’m bringing you this month is Melanie’s http://sugarandspiceandallthingslife.com/ where she writes about ‘recipes and life in general’. She posts easy recipes for no nonsense wholesome food (cake cake cake!) and she is another Devon girl. She also posts photos of England, mainly the beautiful south, check her out. Next is Lily, http://lilymugford.com/ She likes to write, takes part in several challenges and if you like orange you’ll like her blog. Lily is a survivor with a great attitude to life, choosing to rise above circumstances. She is a relative newbie to the blogosphere. I hope you visit, enjoy and that these two blgs are new to you! ‘Do you have a photo which invites the viewer to look beyond? Are there hidden depths in the background? Is the focal point just a framing for the rest of the picture? If it’s not clear why we should look beyond, tell us! Lead us through the story in your photo.’ for this weeks challenge. I’ve chosen three photos and I hope its clear why you should look! It’s Sunday so it must be Jake day and his theme this week is City. He says that a city is a ‘large center of population organized as a community. The word city is derived from the Latin word civitas, which denotes a community that administers its own affairs. In ancient Greece such an independent community was called a city-state; it consisted of a chief town and its immediate neighborhood. The cantons which constitute the Swiss federation are not unlike cities in this sense. During the Middle Ages a city was usually identical with a cathedral town; accordingly, when King Henry VIII of England established new bishoprics in boroughs, he made these into cities. In modern Britain city is merely a complimentary title conferred by the monarch on important towns.